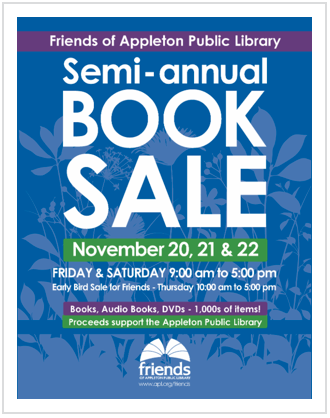 The Friends of APL Fall Book Sale is November 21 and 22 from 9:00 am until 5:00 pm in Appleton Public Library's lower level meeting rooms. Most items are $1 or less. This year we have a great selection of mysteries, science fiction and German books. A limited number of computer systems will also be available. They include a computer, monitor, keyboard, and mouse - all for $100. The Early Bird Sale for Friends starts tomorrow and runs from 10:00 am until 5:00 pm. During this time we will accept new and renewed memberships. Questions? Call the Friends of APL office at 832-3931 or email jquinlan@friendsofappletonlibrary.org.